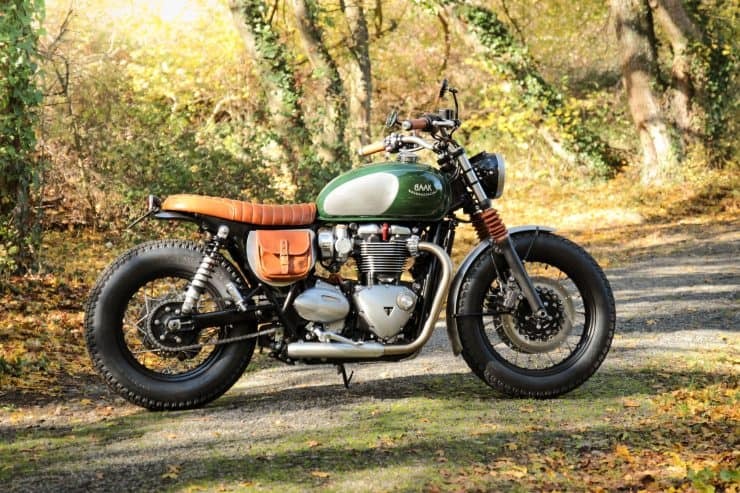 THE TRIUMPH BONNEVILLE T120 More fun that watching a dozen frogs in a Fly factory. 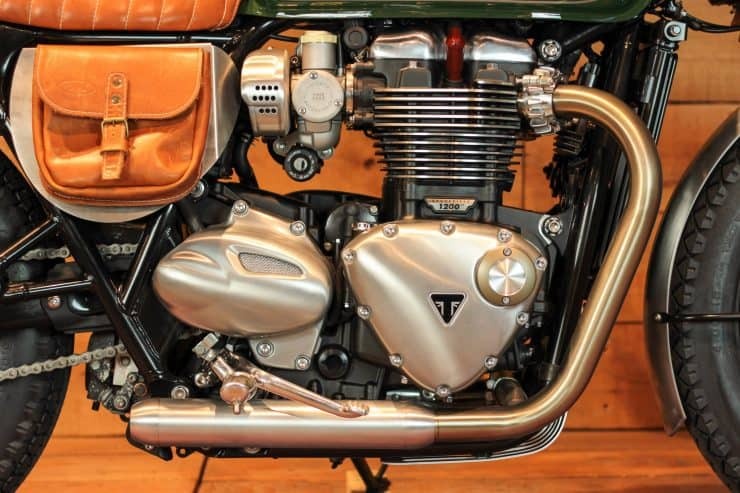 At its heart the Bonneville T120 is fitted with an all-new liquid-cooled parallel twin with a SOHC, 8 valves, a capacity of 1200cc, a bore / stroke of 97.6 mm / 80 mm, a compression ratio of 10.0:1, multipoint sequential electronic fuel injection, and a 270° crank. There’s 79 bhp (at 6550 rpm) and 77 lb-ft of torque (at 3100 rpm), fed to the rear wheel via a 6-speed gearbox and an X-ring chain. 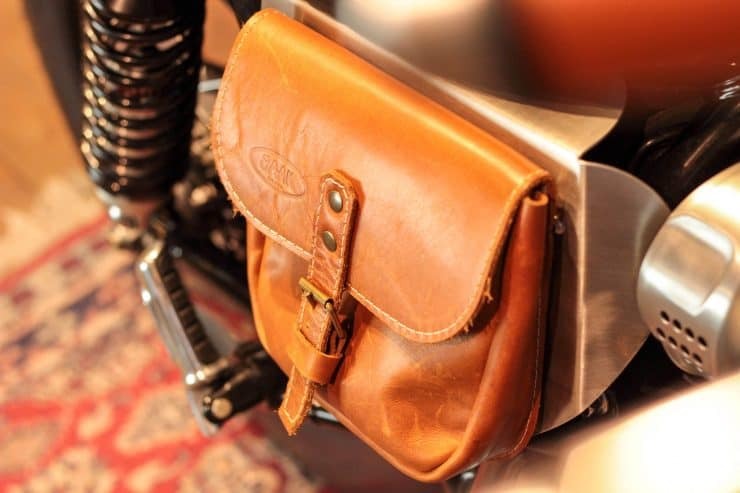 Reviewers overwhelmingly loved it. 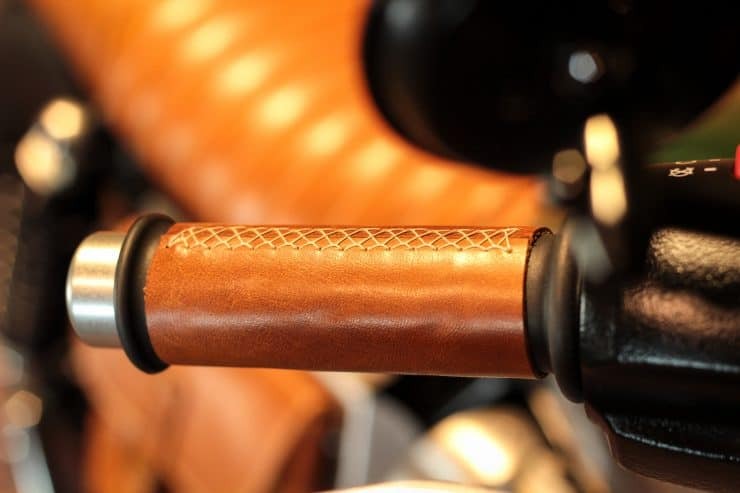 There was a clear and distinct improvement in build quality throughout, and rival motorcycle manufacturers like Harley-Davidson, BMW, and Moto Guzzi had been put on notice. 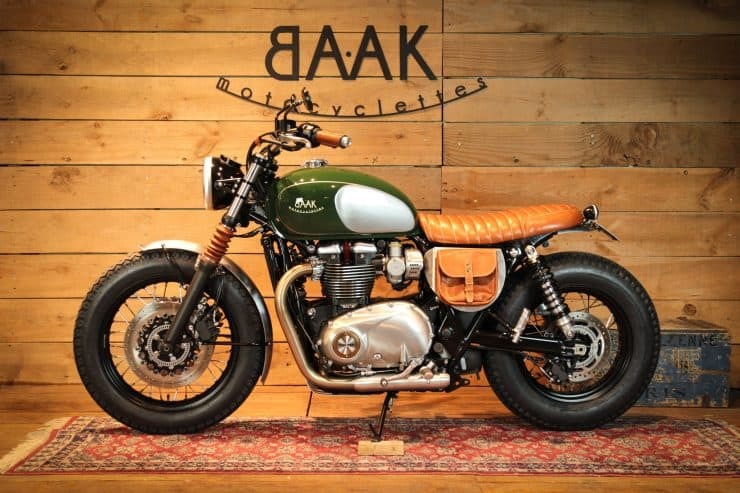 BAAK Motorcycles was founded in Lyon, France in 2012 by Rémi Reguin, it’s since grown to employ five, and the company enjoys a global reputation both for their custom motorcycle builds, and for their in-house developed motorcycle parts for Royal Enfield, Moto Guzzi, and Triumph. 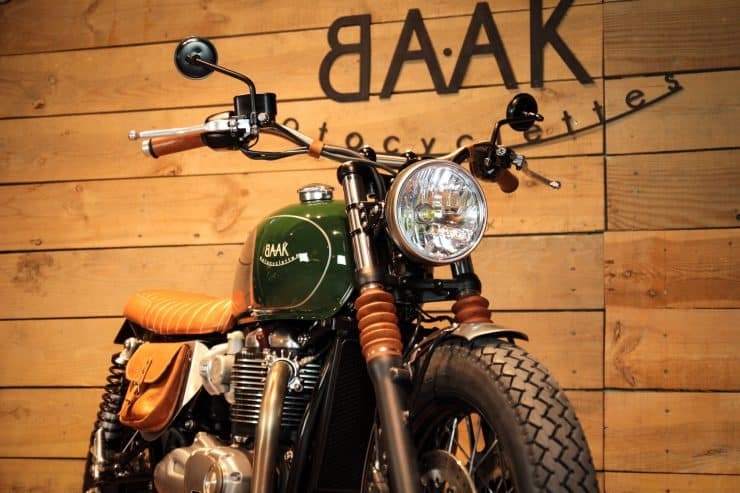 The new T120 is the current motorcycle of choice for BAAK, in fact they’ve probably built more customs using it as a platform than any other garage in the world. 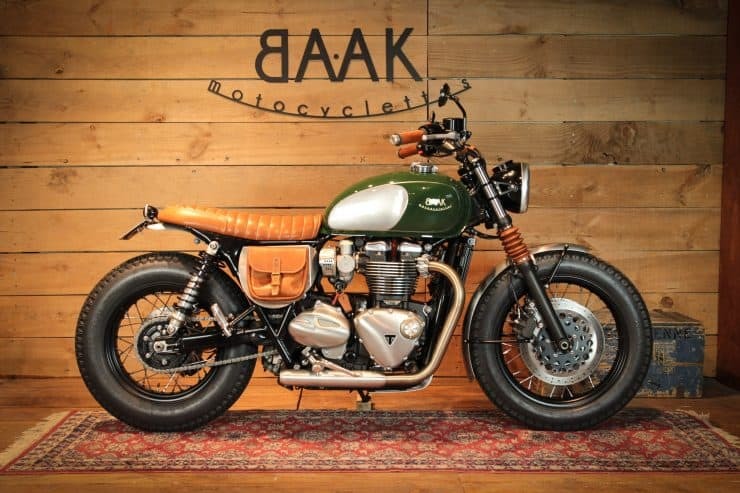 They built this bike for a customer in Spain, his main request was to use a British Racing Green on the fuel tank, as a hat tip to the cars of his childhood. 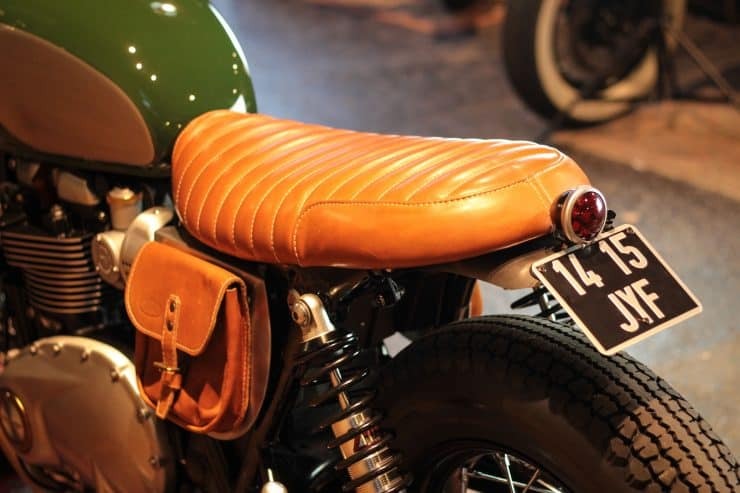 British Racing Green, commonly abbreviated as BRG, is a perfect color for a British motorcycle with heritage like the Bonneville. 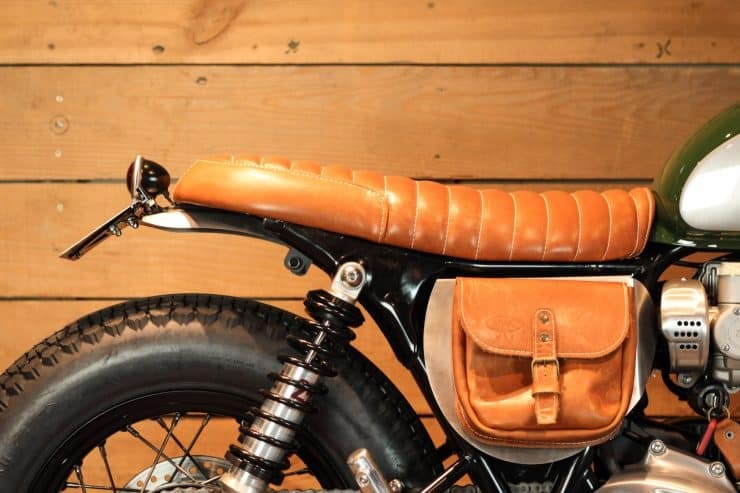 The team at BAAK matched the fuel tank with a medium tan leather seat, side bag, grips, and gators, with brushed steel knee-indents on the tank. 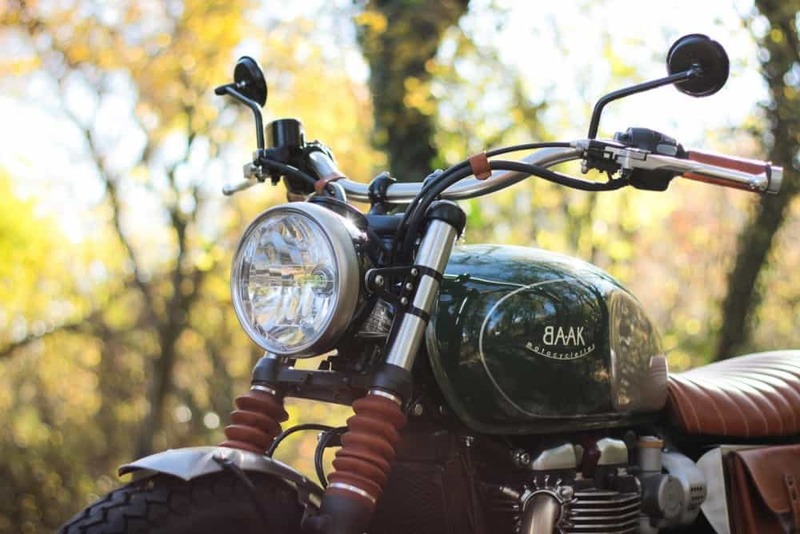 The plan was to lower the bike a little and tighten up the handling, so a pair of Shock Factory -20mm shocks were fitted in the back, and a machined aluminium flat triple trees were fitted up front to proportionally lower the front end. 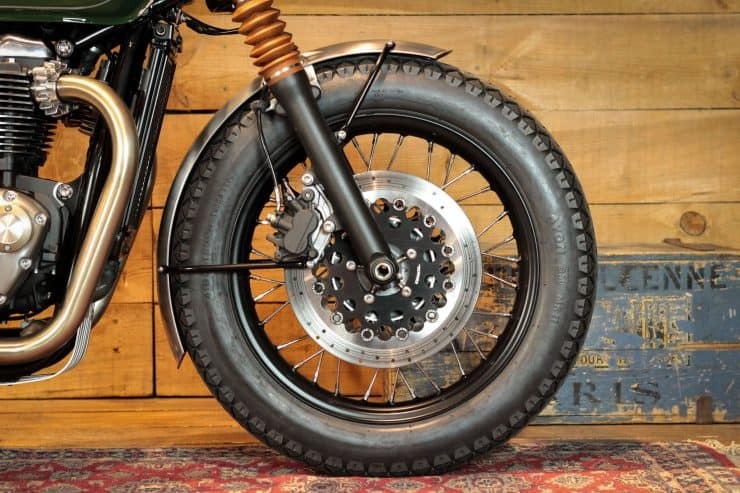 A new 16″ rear wheel was installed and both ends were fitted with Avon MKII tires, giving the bike and vintage look with the benefit of modern tire compounds. 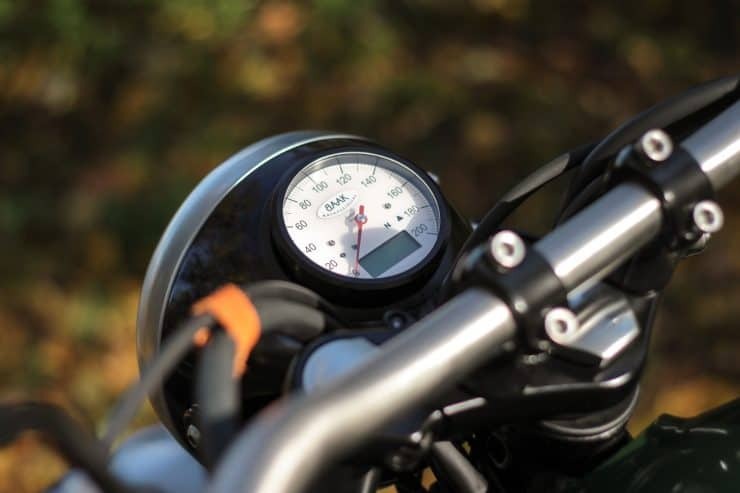 A MotoGadget ChronoClassic dial was fitted carefully into the back of the headlight unit, a nice reference to instrument fitment on vintage British motorcycles, and the team at Baak are currently working on a plug-and-play system for others who want to replicate the look. 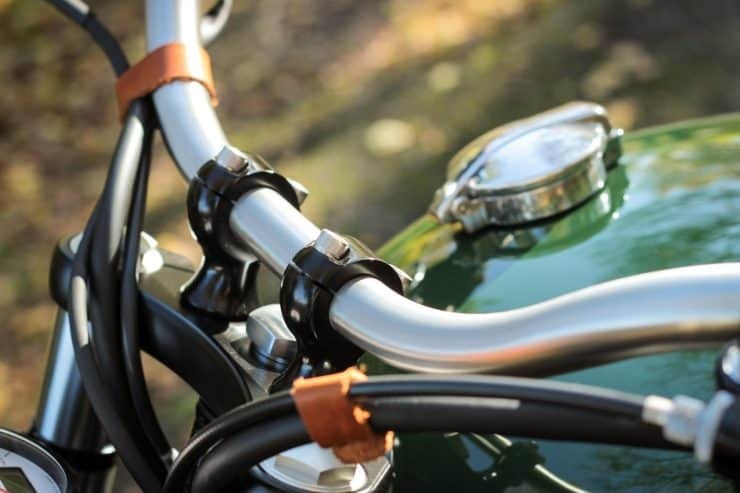 The original handlebar was swapped out for the Baak N°1 wide stainless steel unit, with machined aluminium handlebar clamps, and a mini brushed stainless steel rear mudguard with license plate support – significantly better looking than the factory fitted unit. 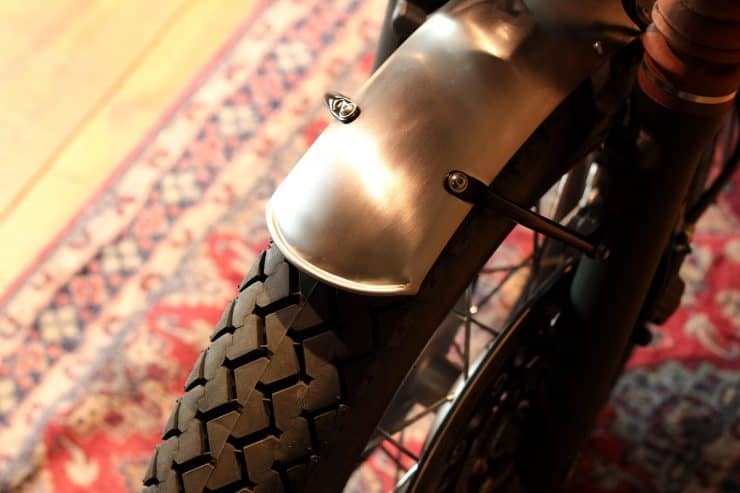 Up front theres a longer stainless steel front mudguard with aluminium supports, Mini LED blinkers from Motogadget, a Monza-style gas tank cap, Beringer Aeronal front brake discs, and proper mirrors left and right. It takes a lot of thought and sketches before you even come close to a final phase drawing of how you want a machine to look and also, the budget of the customers is a huge part of any project, but this time, the froggies got it right on the money. 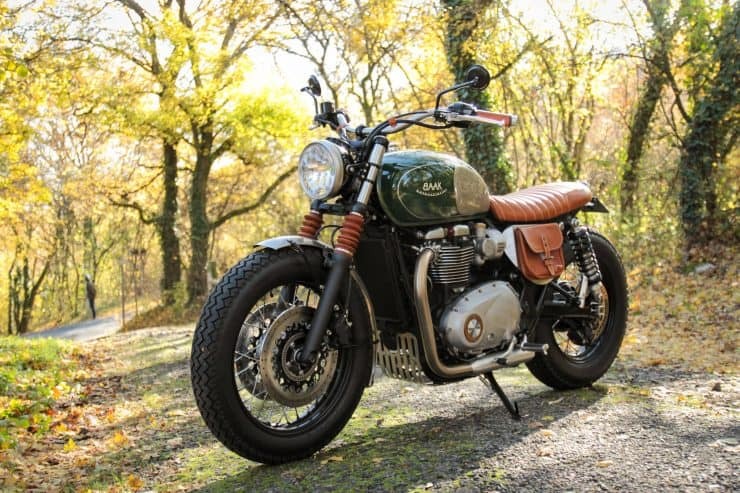 So as I close this for Thursday, hope you all have a great day, the weekend is not too far away now and I know you are itching to either ride your 2 wheeled machine, or jump in the shed and start wrenching to produce your own creation. Thanks for stopping by and if I can help with anything for your machine, even if it is advise, I am here. 714-598-8392 and you can even Text me on that to save more time too. 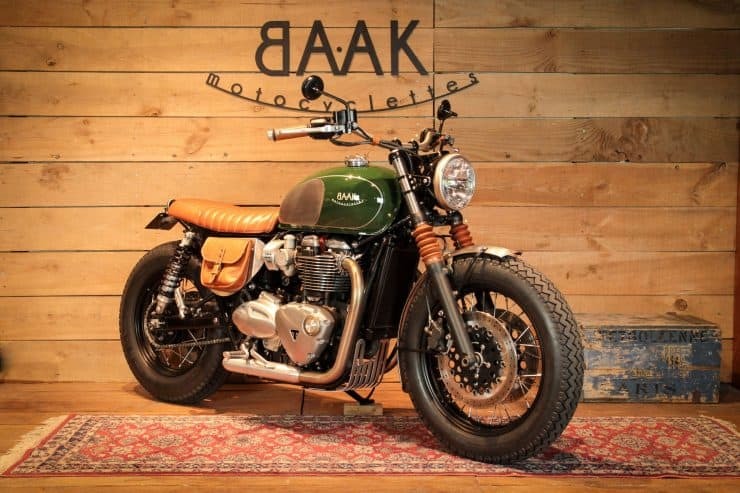 This entry was posted in Blog and tagged 1200cc, Baak motorcycles, bonneville, brat, brit iron, build your own, cafe racer, carpys cafe racers, classic, custom, French motorcycle, Shed built, tracker, triumph, twinline, vintage, water cooled.